William was born prematurely and went home with chronic lung disease, requiring oxygen 24 hours a day. His condition worsened rather than showing signs of improvement and he was diagnosed with ‘presumed cystic fibrosis’ (CF). He underwent vigorous treatment for this, including frequent hospital stays for IV antibiotics and an operation to insert a port-a-cath. His health was deteriorating more rapidly than expected for a baby with CF. He had his first birthday in hospital and was back just a few weeks later. During this admission he had several tests. These revealed that he had very severe reflux and problems swallowing so a tube was inserted through his nose, through his stomach and straight into his intestines. We waited in hospital for an emergency Nissen Fundoplication, a procedure to prevent stomach contents from escaping up into the gullet and lungs, and a gastrostomy so William could be fed straight into his stomach until he was old enough to learn to co-ordinate his swallow. William spent time in PICU following the operation and was then transferred to the high dependency unit before going back onto the ward. We were expecting to be home within a few weeks of the surgery but things did not progress well. It became clear that William’s main problems were to do with his stomach and intestines rather than his lungs. He was in intestinal failure. Nothing was moving along or being absorbed so it was flowing back into his stomach and refluxing into his lungs, causing damage and frequent infections. After three months in The Royal Brompton Hospital, William was transferred down the road toChelsea and Westminster Hospital where they have a specialist gastroenterology team. They diagnosed that he has intestinal failure and is unable to tolerate any feed or drink. Instead, he is fed by an intravenous feed called TPN (total parenteral nutrition) given direct into his blood stream, through a Hickman Line in his chest. He is on his drip 20 hours a day. William continues to have frequent hospital stays due to very sudden and life threatening infections in his line. He can be playing happily and critically ill with septicemia within five minutes as the bugs in his intestines leak into his blood stream and infect his line. To help with this, he had further surgery this year to create an illeostomy so the fluid that accumulates in his intestines can drain out through his stomach into a bag. However, he has continued to have frequent and dangerous infections and is now showing early signs of liver disease. His future is very uncertain and his condition is considered to be life limiting with immediate threat to life because of the infections. We are currently waiting to go to Birmingham Children’s Hospital so William can be assessed for a small bowel transplant. William needs a lot of care at home. We have appointments most weeks and William can be admitted to hospital in a life threatening condition very suddenly. Hospital stays often stretch from days to months. All this puts a huge amount of pressure on the family, especially for Hope and Ellie. William also has cerebral palsy, affecting his legs, and uses a wheelchair when out and about. He is about to get a powered chair to help him gain independence as he grows older. Thank you all for the wonderful welcome back to Post pals over the last few months and the generous gifts, letters and cards. You have all made a difficult time in William’s life so much easier and happier. We had an amazing time at Chessington and Wills loved it so much – especially dragging me onto all the rides in the rain on Sunday morning, winning the ice-cream challenge and seeing all our Post pals friends again. William is pretty much the same as when we rejoined in the summer. He is still on his gastrostomy feed 20 hours a day and has his Hickman line. He remains very distended and ‘full’ in his tummy but has got more used to living this way now. He started his GCSE studies in year 9 in September and gets to school as much as he can – pump and all! His discharge summary mentioned chronic inflammation in his bowel so we will see how things go over the coming months. Being part of the wonderful post pals family again certainly helps us both loads with the ups and downs and the worries and uncertainties. We are going home today after 5 weeks so he can be home for his birthday and have a break. He will be back in 3 weeks. He’s back on 24 hour feed and things like iron infusions and iv fluids when needed. His pseudo is effecting his stomach and duodenum so he’s very uncomfortable. William is back on TPN and will be for a while, potentially long term. His stomach is not functioning and emptying properly and as a result he has developed ulcers. There was a litre of fluid in the top end of his bowel when they scoped. We will be in hospital for a good few weeks at least and home back on feed pump, perhaps back on home TPN. We don’t yet know if this is chronic rejection. William has been unwell for the last few months on and off, nothing too specific, just pain, tiredness, some general viruses and being generally run down and slow. He had been losing weight but we put it down to struggling to keep up with puberty. Last Saturday he started a big bleed in his transplanted bowel and it has taken a week on octreotide, a drug to stop such bleeds, to stop the bleed. His HB dropped to dangerous levels and his kidney’s are currently wobbling as a result. We are not yet sure what has happened, if it is PTLD (a post transplant form of cancer), some kind of chronic rejection or if a virus has damaged his bowel. He is back on TPN and we are anticipating a relatively lengthy stay and going home with a line in, potentially some TPN and certainly with an end to the precious and fantastic 18 months we have had free of lines and feeds, needles and hospitals. Thank you to William’s wonderful elves and other fantastic people who sent cards and gifts for Christmas. It was a very special Christmas as it marked a year after William’s second multi organ transplant. Wills is doing well. His bowel is working well, although he has recently lost a lot of weight and is back on overnight feed, though still eating well too. He just needs the extra calories. He still has his graft-versus-host disease and has treatment monthly in Rotherham Hospital for two days. This will be for life, but the team have learned a lot about how to treat it and get it under control for both Wills and others who follow him. William is doing well since his transplant and is now back at school. He is still battling GVhD (graft-versus-host disease) where immune cells from his donated organs have mixed in with his own and are attacking his own body as a foreign object. He has treatment for this called photopheresis in Rotherham for three days every two weeks and stem cells and high dose steroids in between, where needed. He is being brave as always. William had his call for re-transplant on 19th December. Although we were of course on the list it seemed to come very suddenly and everything happened quickly. He had been going down hill in the month before the call so we were very lucky and grateful to his donor and the brave family who gave their precious child’s organs for transplant so soon before Christmas. William had a very difficult time in PICU with kidney failure and respiratory failure caused by influenza when he had no immune system at all. It was a very scary time for us all. He is now doing a lot better. His new organs are fantastic at the moment. It is very early days and things can change fast but so far so good and we are being positive. We will be in hospital for a good few weeks yet and then six months isolation recovering at home. Thank you so much for the lovely hamper Post Pals sent us to help us celebrate Christmas. It was a strange time as Wills was very sick in PICU at the time but the hamper and gifts helped the girls and I to enjoy our day together. Wills and I celebrated Christmas on 12th Night. Thank you also for the cards and presents he has received. They really cheer him up and it is great to know there are so many people behind us and rooting for us. William received his call on the 19th of December. He lost a lot of blood during transplant and his kidneys have been in shock so he was put on dialysis. In the early hours of Christmas Eve morning his Mum was called in as he wasn’t coping on the ventilator and had to be changed to an oscillator. Thankfully his oxygen levels came up. On Christmas day he was able to be moved back onto the normal ventilator, opened his eyes, and indicated he wanted his stocking. Since then his kidneys and new bowel have started working and he has come off the vent although his lungs keep collapsing. William has opened a few presents and watched Miranda Christmas special twice! Post Pals was able to send some last minute hampers to bring a bit of Christmas to William’s family but they will be in need of smiles over the coming weeks and months. It has been a difficult couple of months for us as the team have decided that William’s transplanted bowel is now in chronic rejection and he needs a second transplant. We are back on the transplant waiting list, this time for a multi organ transplant. It is a huge risk and Wills is very aware of this. It is a lot more scary second time round as no one knows what will happen and if his body will cope. We don’t know when the transplant will take place, we are just waiting for the call to say a donor has been found. In the meantime, Wills is on his TPN 20 hours a day and we are doing the best we can to make lots of precious memories and treasure all the time we have together. William’s transplanted bowel is sadly still not working. He has been struggling a lot with fluid balance and dehydration and so is now on his TPN 20 hours a day. This is a huge set back and his transplant team have decided that now is the time to think about whether or not this bowel will work for William again. We are going for more tests and re-transplant assessment next week. First though we celebrate life and our precious and wonderful donor and her family at The British Transplant Games over the weekend. Thank-you for all the wonderful post. Wills had loads of birthday cards which helped brighten up a birthday which he found very difficult as he wasn’t feeling too well. Thank-you to everyone who was involved in the party. We had an amazing time. Wills especially loved the spider! William is going to theatre tomorrow for a fairly big operation. We really hope this will help his current situation. He will remain in Birmingham Children’s Hospital for at least a week and then will be in Chelsea and Westminster Hospital for as long as it takes to set up home TPN – this can be as long as 2 months but we hope a lot less as Wills has been in hospital all of this year. The MRI scan and contrast study he had last week have shown that he has a partial obstruction caused by narrowing in his bowel behind his stoma. He needs an urgent operation but it can’t be done until Wednesday next week. He’ll be in Birmingham about 2 more weeks and then transfer to Chelsea and Westminster to sort out home TPN. We hope the operation will solve a lot of his current issues but the team still think his bowel has had a big hit and he’ll need TPN for a while at least. Wills has now been in hospital for 6 weeks and the end is not yet in sight. His transplanted bowel is not absorbing after a virus and we don’t yet know if it will heal or not. He had been through a lot of procedures and has been very ill with pneumonia from aspirating bile into his lungs. He is having a jej tube inserted this week and then we will transfer back to Chelsea and Westminster hospital to organise the funding and care packages for home TPN and iv drugs. We are expecting another 6 – 8 weeks in hospital and life will be changing quite drastically for us all. Thank you to everyone who has sent cards and smiles. You are making a huge difference at a difficult and worrying time for Wills and all of us. Thanks for the wonderful cards that are brightening William’s room. Thanks also for the DVDs and other gifts. I’m sorry I can’t thank everyone by name. Wills has become very ill over the last 48 hours with pneumonia and has been needing a lot of oxygen and CPAP. We narrowly escaped PICU (they got as far as assigning him a bed which they are still keeping free for him in case) and everything in our room was moved around to make space for the extra equipment and people coming in and out and, in that, I lost the list of people to thank. Wills is very poorly and just sleeping at the moment but will enjoy everything when he feels a bit better in a few days. Sadly, this will make this stay even longer as we have to get over this before we get on with the plan to get his TPN stable enough to transfer back to London and get set up for home TPN again. Wills has rejection or infection, not sure which. We’re in our local hospital at the moment but may transfer to Birmingham. In the past, these situations have led to very long stays and going right back to square one so we are hoping not this time. William has been doing pretty well over the last few months. He is having a few little difficulties though. His transplanted bowel is fantastic and keeps him alive and healthy in general, but it isn’t absorbing food as well as it should and, after a few months losing weight, William has had to go back onto overnight feed every night with no nights ‘off feed’ anymore. His bowel can’t cope with the volumes needed on the feed nights anymore to allow feed free ones. William was disappointed with this as he had worked hard with his eating to earn these nights off. William has mild cerebral palsy and we have always been warned that this may impact him more as he grows. Over the last few months he has developed spinal curves called ‘hyper-lordosis’ and scoliosis. This is caused by his right side being weaker than his left and having hyper mobility in his trunk. We are waiting for a hospital referral to see a spinal specialist. It is likely he will need a brace. In the meantime we are implementing a new physio program that Wills isn’t too happy with. We’re looking for ways to make it fun for him so it doesn’t seem like a chore or ‘treatment’. We have an exciting summer coming up with a birthday party, a holiday in Devon and preparing for a new school as William is leaving his special needs school to go to a mainstream school with support. It’s a huge step but will be fantastic for him, although I am, naturally, concerned about him leaving his little bubble, especially at a time when there are a few changes for him. The OT had just told the school which special chair to order for him but, now having seen his back, thinks they need to cancel it and buy a more supportive one. I guess that will help them learn how things can alter so fast for our children. Thanks, as always, to everyone who sends William and Ellie post. He is always so excited when the postman has something for him. I hope you all have a wonderful and sunny July. Happy New Year everyone! Thank you so much to everyone who sent the children gifts and cards, especially the wonderful elves. The children loved everything they received. It was a special Christmas because we were home for the very first time. William has only had three Christmasses home from hospital – one he was a baby and the other two we with family or friends so it was very special to be doing our own Christmas in our own home. We hoped to last year but Wills was rushed to hospital a few days before. We had a few scares that this may happen again this year as he wasn’t himself over Christmas and we had a few hairy days but we managed to stay home. We’re still not sure why he has been under the weather and tired over recent weeks so he’ll have to have some blood tests to see what’s going on. Hopefully just a normal virus. This is potentially a big year for William as we have a big decision to make in March. Most bowel transplant recipients have their stoma reversed after a year but William still has his because he has no colon and his underlying diagnosis of pseudo-obstruction means we don’t know if the colon stump he has will work. 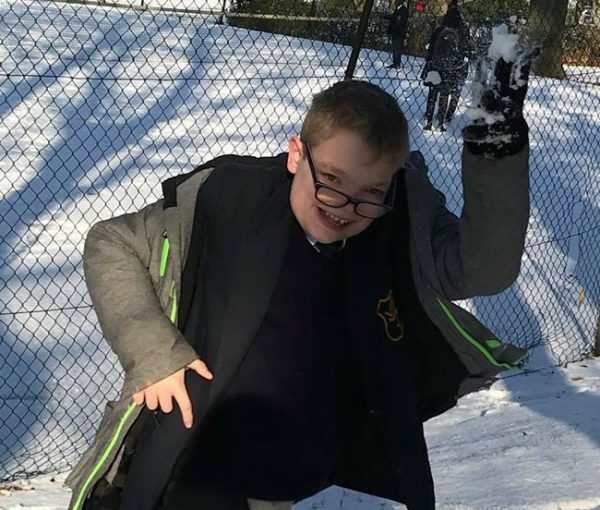 For these reasons, at the time of his transplant we were told his stoma would be for life but there have been advances in the US where children like Wills have had constructive surgery to reverse the stoma. William’s team are divided as to whether we should give this a go or not as it is a big op and may not work. We are having his annual review in March and will all have a big discussion to make a decision. If we decide to try the surgery it will happen in the Spring. We’ll let you all know. We hope you all have a very happy and healthy 2013 and we look forward to sharing it with you. I’m sorry it has been a while since we updated. William had a tough start to the year but has been doing a lot better since but I have had some ups and downs and I’ve just been in hospital with my chest, which adds extra strain on the family. William had a great summer enjoying the Olympics and especially Paralympics. He has since taken up archery so, you never know, you may see him there one day! After a rocky and worrying start to the year, his bowel has been behaving itself very well since and he has even been able to reduce his feed a little and have a night off the tube. We still have a long way to go to get him back to where he was before his last set back but he is doing really well with eating and drinking milk and everyone is very proud of him. William has mild cerebral palsy and, its funny, but that only really comes into the foreground when he is medically well as it’s not a priority otherwise. Over the summer, William was getting more tired and walking more ‘lopsided’ than he had been and we think this is due to his body growing and putting different pressures on some muscles and tendons that are too tight and others that are too loose in his body. He has extra supports in his boots and we are hoping that will help. We are also trying to get him into more sports and activities that will keep his muscles strong so he can stay out of using his wheelchair for as long as possible but we are having to get it out on longer journeys and when he is feeling tired. Time will show if his cerebral palsy becomes more of an issue as he grows but he is a tough little thing and it rarely gets him down. The Paralympics were great for him to show him he can do whatever he wants to do – not regardless but because of who and how he is! November is a special month for us as it is William’s transplant anniversary. We wouldn’t have him here with us if it were not for his wonderful donor and brave family and our thoughts and prayers are with them and the pals who are waiting for their special gift or whose gift never came in time. Thank you for all the wonderful post that puts so many smiles on our faces. William came home from hospital at the beginning of February. It’s great to be home and settle down again. William’s bowel is good enough to absorb special feed now where everything is broken down to it’s most basic and simple form but he still isn’t absorbing food properly. He is allowed to eat but we don’t count what he has as calories. He is still on his feed 18 hours a day. We don’t yet know if this is permanent or if he will recover but very slowly. He is going back into hospital in April for more investigations and to have his Hickman Line out – which is great news! Although he may need another one if he needs a spell on TPN again in the future, it is a huge infection risk to keep it in just in case. It has been hard for us all to adjust to William’s set back but we have settled into a ‘new normal.’ Cheery post really helps all three children and William is so excited when it arrives. Thank you so much to everyone for the wonderful letters, cards, stickers, colouring sheets and craft sets William has received this month. He is always so chuffed and excited to get post. He especially loves things that make him laugh at the moment so a joke, funny rhyme or funny letter make him giggle and giggle for days. He also loves hearing about animals and their antics, especially Dotty! I would thank people in person but William has torn a few packages before I’ve had the chance to jot down the names from cards that went with them and I really hate missing people out. Please know that everything is very much appreciated. Hope and Ellie loved their jewellery kits. Hope had a beautiful cushion sent to her when William was in hospital, as her January gift, and can’t find the card that went with it. Please let us know if it was you as she really wants to write and thank you. We hope you all had a wonderful Christmas and that 2012 has started well and will be a fantastic year for you. William had been doing really well for most of last year but became very unwell a few days before Christmas – wonderful timing! He had a viral gastroenteritis but, unfortunately, it really unsettled his bowel and led to some patches of rejection. We were transferred from our local hospital to Birmingham Children’s Hospital (our transplant centre) on 23rd December so spent another heart breaking Christmas in hospital and away from Hope and Ellie. Wills is still in Birmingham and has a new Hickman line ready to prepare to go home on intravenous nutrition and fluid support. We start the year with a great deal of uncertainty for all of us and it is hard for us all, especially the girls. We are very grateful for Post Pals and knowing that so many wonderful people care enough to send us smiles to help us on our way. Thank you so much to postman Zack and his Dad who came to see us at Birmingham Children’s Hospital, the morning after our transfer there, to bring William a balloon and Christmas present from Post Pals. It really brightened up a stressful time and difficult Christmas and Wills loved his smiley balloon and Pepper Pig book and dominoes. Thanks everyone for the lovely welcome back. William is delighted to hear from old friends and new ones and has an especially big smile when a letter from Dottie arrives for him. William has had a fantastic year and we were even weaning him off some night feeds but things have now changed so we are rejoining Post Pals. In December, he had his annual review and, in general, was doing well but was diagnosed with asthma and had lost some weight. He became more and more chesty throughout December until, on the 20th, he woke with a fever and a high stoma output. It was the day of his nativity play and Wills didn’t want to miss it so we struggled in. By the end of the day, he was very unwell and back in hospital. We were all gutted to face another hospital Christmas but made plans to make the best of it but things weren’t improving so William was transferred to Birmingham Children’s Hospital on 23rd December. He is still unable to eat or drink and is being treated for infection and rejection. It will be a long journey back until his bowel accepts feed again and we are expecting to go home on TPN. We were lucky to have had a stable year but we knew children who have had bowel transplants can enter back into more fragile health literally overnight and that is exactly what happened with Wills. It’s upsetting and disappointing, especially for Hope and Ellie who are facing starting an important year (with GCSEs for Hope) with disruption and being separated from their mum again, but we will make the best of things. I know Post Pals will help keep the children smiling like they have done before and we thank you all for that. I’m sorry for the delays in updates. Wills has been great but I’ve (Mum) had some big ups and downs with my own health and been in hospital. William has had a good couple of months. He had his school review which was very positive. I was hoping he would spend some time at a mainstream school but everyone agreed that he is best placed in the school he is in (for special medical needs and physical disabilities) without any sessions in mainstream as it would cause him anxieties given his Aspergers Syndrome. Wills still hasn’t yet managed a whole school year without any long hospitalisations and needs to have a good, long settled period. William has started a special trampolining club and has already got his grade 1 badge and certificate. It’s great because the children get them when they do the exercises the best their bodies will allow. He absolutely loves it. Oliver, the puppy, is growing fast and is giving William a huge boost in his social confidence. It’s lovely to be able to write such a positive update. I hope they’re all like it this year. Thank you for all the wonderful gifts the children had over Christmas. I’m so sorry for not being able to thank people individually. I was unwell over Christmas and didn’t manage to keep on top of our thank you lists. The children were all delighted with their gifts and elf boxes and the reindeers sent beautiful sparkly letters this year. William was really excited whenever one landed on the door mat. William loved his memory gift. He had a pet scrapbook kit which he is going to fill with memories of Oliver as he grows up. He also had a lovely photo block and a train card which he really loved. He is train mad still! I’m sorry for the lack of updates over the last few months. We’ve had a difficult time, not least because I (William’s Mum) have been ill and even ended up in intensive care for a few days. William has also been in hospital with a life threatening infection – something we haven’t seen since his transplant. All in all, it has taken its toll on me a bit and everything else has kind of stacked up and I’m behind. It’s all been very stressful and difficult for the children too. On top of all of that, we’re in the middle of a major building project to make our home wheelchair accessible for William. This adds to the stress and disorganisation but it will all be worth it. This month sees William’s second transplant anniversary. It’s always an emotional time. William wouldn’t be here if it wasn’t for his wonderful donor family and we always feel mixed emotions on his anniversary as we think of the amazing family who said yes to save his life. This year has been a more difficult year than last and Wills has spent 3 months of it in hospital with various complications. He has had to go back to a special feed to help his absorption but it is still a million times better than life before his transplant – he’s still alive! I’ll update more about his transplant review next month. William now has an official diagnosis of Asperger Syndrome on top of his health and mobility issues and this has been difficult to deal with. We need to spend some time reading and getting to grips with the huge amount of literature we have been given and come up with some strategies to help him learn to live with it. We do have some exciting news – a new addition to the family! Next month, a puppy called Oliver will be coming to live with us and learn how to help William cope with his Asperger’s. Oliver is a special wish from the Starlight Foundation and we are so grateful to them and Oliver’s breeder for their generosity. We will be busy training Oliver to do the things all dogs need to learn but, on top of that, I’m doing a special course to learn how to teach him to support William and help prevent and control melt downs etc and help William socialise. I’m hoping Oliver will soon be William’s special friend. Hopefully, next month will be less stressful and I can give a fuller update. In the meantime, I wish everyone a fun filled and safe bonfire night and hope all other Pals have as healthy a month as possible. Thanks for all the lovely letters and cards. We love the letters from Dottie. William called his puppy Stripe! As only William would do! We will get some photos and news as soon as we can. William loves his post. As things have been so hectic, I haven’t been able to keep lists so don’t want to mention any specifics in case I miss anyone, but thank you for everything you send. It has put some smiles on some very troubled faces in the last few months. William is coming home from hospital tomorrow! Please can post now be sent to the C/O address rather than the hospital, thank you. Wills is going on TPN on Friday and we’ll be here at least 6 weeks. I think the hospital address could go up as the main one on his page for a while sadly. Wills is very upset and frustrated so would love some post, especially making sets and Thomas things. William is feeling very poorly and down now. We are going to be in Birmingham Hospital for a while so please can post come here. He is doing a World Cup project and collecting the Panini stickers (in pretty much every shop at the moment) so they would be great and cheap little things to send. He also loves sticking and making things and Thomas of course. We’re just hoping he won’t have to go back on TPN! William has been in hospital since Wednesday and will be in at least all of next week. He caught Rotavirus – a common tummy bug for most, but dangerous for bowel transplant children. He’s currently being treated to try and prevent rejection as this often triggers it and is off feed. We won’t be introducing feed again until next week and may have to go back to the beginning and do it slowly. Wills is very fed up! I’m sorry for the lack of updates lately. Things have been hectic with juggling tight deadlines at work and a lot of hospital visits. Wills is still doing very well after his transplant but we have had a few small setbacks. William’s illeostomy had been prolapsed for a while but, in April, the team decided it needed to be re-done. This meant having his bowel re-sectioned and a new stoma formed. Ten centimetres were removed from his bowel, which isn’t much, but it seems to have made a difference to his bowel function. It’s all still fine but William is having higher output and we’re back to measuring and replacing his losses. He’s very well in himself so we’re not too worried but will have to keep an eye out for signs of infection or rejection. We’re hoping his bowel will settle back down again. It can take time after bowel surgery and Wills always seems to do OK but take his time after these things. The biggest news is that we’re nearly there with getting a diagnosis for William’s Asperger Syndrome. The sad thing is that we have found that he has a big problem with the sensory side of autism and that will have felt more intense pain from all the operations and procedures he’s been through. We’ve often noticed he needs more pain relief than they expect and William’s team at Birmingham are fantastic at keeping him well monitored and comfortable. Now we know, we can make sure this continues. We’re slowly learning how to cope with his ‘meltdowns’ and make sure his autism has the least impact on his life possible. It has its moments though! William’s serial casting and operations for his feet deformities were successful which is fantastic. We are working harder with his physiotherapy and OT at the moment to help him make the best of his abilities. Overall, we’re having a few challenges but he’s happy, the girls are happy, and that makes Mummy happy. William loved his space sticker book – space is one of his fascinations. Thanks so much. He really appreciates everything people send him and loves getting post. All the children do. Wills is having an operation on both feet on Wednesday and is really upset about it. He will probably only be in hospital for a day but he is terrified about ‘special sleeps’ and is really unsettled because of it. His Asperger’s Syndrome makes it really hard for him to understand and come to terms with the idea of medical procedures coming up. He is back in plaster casts on both legs now and will be in casts at least 6 weeks after the surgery. It is likely he won’t be allowed to walk on them initially. We’re going to Birmingham on March 18th and may be told then that he’ll need a big operation to re do his stoma. It is prolapsed and it’s a matter of time before this has to be done but he’s very anaemic at the moment and this may signify that the bleeding caused by the prolapse is causing problems. I’m really hoping we can get away without the stoma operation for a while with him having to have the feet operation next week. Other than some coughs, colds and flu over winter, he’s had a good run over recent months, but could do with some smiles over the next few weeks. Wills continues to do very well after his transplant. We have had a difficult winter in terms of how often he’s been unwell with colds and a possible bout of flu but, thankfully, this has only led to him being miserable and grotty. We have been able to manage it all at home. We still have the uncertainty as to whether or not he’ll need his illeostomy re-forming because it is prolapsed and covered in sores. Each time we go to clinic in Birmingham the decision is put back to next time as it will be a major op and could unsettle what is currently going so well. It will have to be done eventually. Wills is working hard with his physio. We are still exploring the diagnosis of asperger syndrome – something that makes it difficult for him to cope with the change in routine being unwell brings and can cause a lot of upset. The girls find it hard too. Wills is fantastic though and the little ‘quirks’ this syndrome gives him only really help to make him the little boy he is. It’s been a hard start to the year because we lost a close friend who died after transplant. This has unsettled William and made him realise that a transplant comes with complications that are not always conquered. A lot of children we know who had small bowel transplants several years ago are struggling now, some needing another transplant. This reminds us to enjoy every precious day we have with William. We are looking forward to spring now and hoping we, and other Pals, have a settled and stable time ahead. Thanks for all the smiles the children have had these last couple of months. I think our December update was lost in transit and I don’t want to repeat everything but will say again thanks so much to the children’s elves, especially the lovely ones who put in a few pampering bits for Mummy, much appreciated. The children had some very kind and thoughtful gifts and we are so grateful for everything. Thanks so much Maria and Michael for the smile box. It came when we were all very sad after losing a close friend and cheered the children up no end (and so me too). Thanks to Milly and Alice P for the fab face paint kit. The children have been very creative, especially transforming William into a super hero, and we’ll send you some pictures with some bits we are sorting for you. We celebrated William’s first transplant anniversary on November 20th. Our thoughts were with our donor and her family while we thought how well Wills has done this year and how far he has come. He is doing really well. The hardest thing for me to cope with this month is that, as his health is less of a worry (at the moment at least as I always have to say that as things can change very quickly for transplant patients) attention is turning to his other problems. One of William’s hugest achievements this month is that he is drinking fortified strawberry milkshakes (scandishakes) in the day time and is not attached to any tubes in the day for the first time ever in his life. 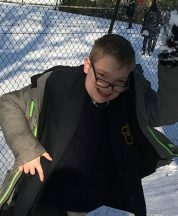 I was hoping William would be able to start main stream school now but had a difficult parents evening when it became clear to me that his physical disabilities, caused by his cerebral palsy, still need a lot of input and that it is becoming clear that he has high functioning Asperger’s Syndrome. The Asperger’s explains how distressed he can become at times and means that we will have to work harder to prepare him for hospital admissions and procedures. On balance, William is best remaining in the school he is in for now and we are lucky we have such a fantastic school for him. The girls have found it difficult to accept his wider problems as they feel it is all so unfair. They could do with some smiles. I always knew he had a syndrome and this is all part of it. We are just so happy and thankful that we have him, he is alive and he is incredibly bright, intelligent, sociable and charming. Asperger’s Syndrome is very much misunderstood and doesn’t deserve the somewhat ‘taboo’ reputation it has. We are looking forward to our first Christmas at home together in four years and hoping William stays well. I hope all Post Pals children, families, pals, staff and supporters stay as well as they possibly can over Christmas and everyone has a very merry one. Thanks this month to Post Pals for the lovely first transplant birthday card. As always, we love hearing what people are up to and it is always lovely to hear the news from Maria and Michael. I am sorry we haven’t updated for a while. I thought we had last month. I have been crazy busy with a campaign to raise awareness of organ donation to save the life of a 20 year old girl who will die without a transplant. It snowballed and I haven’t really had much time to think about anything else. As always though, we really do appreciate the cards, letters and gifts that so many wonderfully kind people send the children. William is doing really well at the moment. He has just had his legs in casts for 5 weeks to help soften up a deformity in his feet. He was a little star throughout the process and can now walk with his heels down. We are waiting to see what happens over the coming weeks and whether or not he will need a little operation to release the tendons in his feet. It is hard to believe that it is nearly a year since his transplant. He has been really well but we are not yet out of the woods. They don’t relax until 2 years after a bowel transplant so we are half way there. He may need further surgery on his stoma in the coming months. He’ll have a surgical review at his annual review in a few weeks time. This will be the first winter he has been home after his transplant. As he is very immunosupressed, I hope he doesn’t struggle with the bugs that love this time of the year. Family life is the most settled it has ever been. I just hope it lasts for a nice long time. The best news is that William is beginning to relax and enjoy food for the first time in his life. For now, it is just strawberry fromage frais, milk shake and lollipops, but it is a huge start as he wouldn’t put anything in his mouth until recently and, as he was nil by mouth, never learned the skills as a baby. Thanks for the lovely Halloween cards this month. We also always love hearing what people are up to and William loves hearing all about Michael. Thanks so much for the Halloween things and for William’s lovely red scarf. It looks great and will certainly keep him warm. William is continuing to do really well following his transplant. His stoma is a bit of a mess and he will need further surgery over the coming months. He is very traumatised by ‘special sleeps’ so we are waiting until he has had time to work on his fears with a psychologist. Now William’s health has settled, working to reduce his minor disabilities from his cerebral palsy has become a priority. We are waiting for him to see an orthopeadic doctor to start the process of serial castings and tendon release to help his walking. This will be painful and unpleasant but worth it in the long run. William has complex issues so there will always be things on the horizon for him but he is so happy to be well after his transplant and it enjoying life to the full. It is transplant awareness week on July 5th. Please do think about joining the donor register and tell your family and friends about children like William whose lives are saved by that special gift. Thank you for our post and for Hope’s birthday cards and the cards to wish William well as he re-starts school. Special thanks to Maria and Michael who write to us so often and for Hope’s lovely birthday present. It means a lot and we love hearing about what you are up to. It has been another great month for William. There are a few blips though. The main concern is William’s stoma that is pretty badly prolapsed. The better he feels, the more knocked around it is getting and there are now a lot of sores on it that can bleed. It may be that Wills will need another operation to re-do the stoma. We are hoping not but expecting that this will be on the cards in the coming weeks and months. William is on fantastic form and is better than we had ever dreamed he would be after his transplant. He does have the odd day when we being to wonder what is going on and these serve to remind us that a transplant is not a cure but a new condition really. It is still fantastic because I am not sure William would still be here if it were not for the wonderful gift his donor and the family gave to us. The anti-rejection drugs are causing William to have diabetes and that is generally stable on two insulin injections a day but can prove to be a bit tricky from time to time and he may need to have more injections with feeds. Wills has begun to eat which is fantastic!! He eats fromage frais but only when he is being gently bribed at the moment. All in all, things are great and it is so nice to be a stable family at the moment. We know there will be a few more ups and downs yet though, but we were told to expect them over the first couple of years after transplant. Thanks for all the lovely Easter cards. They were very much appreciated. Thanks for the notelets for Hope and Ellie, the magic eggs and all the lovely Easter gifts and craft sets the children received. They were very much appreciated as we enjoyed our first celebration time together after William’s transplant. I think this is the first time I have ever written this in an update – William has been well all month! He has had a fantastic month and is doing really well at the moment following his transplant. The only slight concern is that he had to increase his insulin injections for diabetes to twice daily and may need to begin having additional injections with feeds. He is really brave for all his injections and blood tests though. He is putting on weight so well that we had to decrease his feeds. He really is doing so so well. We are now working hard to increase organ donor awareness in the hope that others may get the transplants they so desperately need as soon as possible. It is still early days for William and I have to try not to get too carried away with how things are going now as we have been told to expect ups and downs in the first two years. William is still in isolation at home and so is really enjoying the craft packs and things to do. The children are loving their Easter post. We were hoping to go away to our hospice for Easter but had to cancel as someone there has chickenpox – something very dangerous for William. With three children having to stay away from civilisation for two weeks, we are really grateful for the Easter make sets, colouring sheets and for the notelets Hope and Ellie have received. You can expect some rather classy thank-you letters coming your way. William will remain in isolation until the end of May and will continue to have weekly blood tests. He will have a short admission in Birmingham at the end of May and, if there is no rejection, he will then be able to take his new tummy into the big wide world again. William is now home again after a nasty time with pneumonia and subsequent complications with his new bowel. All is going very well at the moment. We have a lot of hospital appointments and blood tests but, in between, William is enjoying a life free from intravenous drugs and being attached to a drip nearly all day. The next two years will have their worries and emergencies but we finally have a chance for some stability and normality in between. William is drinking water but not yet eating. He has to learn all the skills and gain confidence so this will take a long time and involve a lot of hard work and input from speech and language therapists and psychologists. Thank-you so so much to all those who sent cards, letters and gifts to William. Hope, Ellie and myself during the last three months since his transplant. We have been amazed by people’s generosity. I can’t begin to tell you what a huge difference it made for us all. It helped us to feel so very supported and cared about. The post has been the highlight of William’s day. We are writing to those of you whose addresses we have but have a lot to do in catching up with work and school work so it will take us some time. All William’s cards and letters are being put into a special scrap book that will be part of his transplant memory box. We had a great start to the year in that William had had his transplant and was doing well and we had a future to look forward to. We got home at the end of the first week of the month but things went downhill almost straight away. William was unwell at home and was back in hospital within 2 days with signs of a nasty infection. This turned out to be pneumonia and he had a very tricky time with it. He was on a lot of oxygen and there was talk of intensive care but, William being William, he fought hard and got better without any need for that. He picked up fast but, unfortunately, his new bowel struggled with him being so poorly and was beginning to look like it was rejecting. We were transferred back to Birmingham Children’s hospital for tests. Thankfully, he does not have rejection but his bowel is not being as effective as it was before he became so ill. We are still in Birmingham where the team are trying to work out what has happened and what to do about it. William did really well and got home following his transplant. Unfortunately, our time at home was short-lived. He didn’t seem right from the very next day and spiked a temperature within two days. We are now back in hospital as Wills has pneumonia in both lungs. He is pretty poorly and requiring IV antibiotics, fluid drips and oxygen. We are hoping he will turn a corner quickly and are also concerned as infections can cause rejection, especially so soon after a transplant. Poor William has been through so much and deserves some good luck soon. Hope and Ellie are very upset as they were so looking forward to us all being together at home at last. We don’t know how long it will take to get to that day at the moment. December has been an eventful month for William. He received the special gift of a new tummy (small bowel transplant) on November 20th. He did very well initially and was quickly out of intensive care. However, he then had recurrent problems with blockages in his new bowel and had two further operations. His bowel was slow to get going and we spent many anxious days. Things took a big turn for the better towards Christmas and his bowel began working well. He was slowly weaned off the intravenous feed that has been keeping him alive for the last three years as he became able to tolerate a special feed delivered into his tummy through a tube. He is allowed to eat but has not learned the skills he needs to do so. That will take time. William has continued to do well and we are hoping to go home in the next few days. He has some problems with his stoma (where the bowel comes through the skin) and there is a chance he will need further surgery in the near future, but we are hoping things will sort themselves out naturally. Due to the high amount of steroids and anti-rejection medications needed immediately following a small bowel transplant, William will not be allowed to mix socially, go to school, or go to shops or busy streets for another four months. He will have frequent hospital visits, blood tests, and short hospital stays over the next two years and may need readmission to hospital if he catches any infections or viruses or experiences any rejection. The fist two years post transplant are the most vulnerable. For now though, he is better than he has ever been in his life and, apart from three one hour bolus feeds a day and an overnight feed, he is finally free of lines to really get exploring his world. Thanks for all the lovely get well and Christmas cards William and the girls received. William looked forward to the post every day and the girls really appreciated being thought about. I do want to say a few special thank yous. Thanks for William’s fantastic Thomas night light and torch. It has never left his side and was the only thing he was interested in when he was really unwell. He even holds it in his sleep. Thanks for the Thomas DVDs sent for Christmas. I let him have them early as it was just what he needed when he was unwell. Miraculously, they were ones he hadn’t got and some new Thomas episodes were a welcome escape from the constant medical attention he needed. Thanks to Becky for making him a fantastic Thomas pillow case. It has only been off for washing. I must also thank those who sent Mum a little something to cheer her up. Thank you for the parcel of washing things and chocolate. It was a lovely surprise during those early worrying days. Thank you for the beautiful candle for Christmas. I can’t wait to light it when I get home. Thank you so much Munira for the wonderful flowers you sent at Christmas. The turned my bare hotel room into a home for myself, Hope and Ellie over the Christmas period and filled it with a lovely scent. Thanks to our wonderful Elves. The children were absolutely thrilled with their elf boxes. William loved all his Thomas things and I had very excited phone calls from the girls to tell me about their elf gifts. The children shared the other elf and opened the box together on Christmas Eve. That was a lovely time for them all to be doing it together and they were all chuffed to bits with the gifts. We have been totally astounded by the generosity of strangers during this time in our lives. William will be isolated at home for the next four months so all those books, colouring books, sticker, craft kits etc will be very much valued for the long weeks to come. What an exciting end to November we had! William had his call for transplant on 19th. It all happened in a very dramatic way as he was on the operating table about to have another emergency procedure. He had his small bowel transplant on 20th November. Since then, we have had our ups and downs. Things seemed to be going very well at first but, over the last few days, William’s new bowel has stopped working. We are not yet sure if he will need further surgery or if we will just have to be patient and hope it gets going again. These are early and anxious days. I am updating our blog at www.sarahmilne.blogspot.com each day so you can follow William’s progress more closely there. Thanks for all the post. It is certainly helping keep him going at the moment. They have a very organised post system here and William looks forward to post time with the hope he will have something. He loves reading his letters and cards and enjoys all his gifts. He really appreciates everything and, with the prospect of several months in isolation, Post Pals is really coming into it’s own for him right now. Hope and Ellie appreciate all their cards, letters and gifts too. It is an anxious time for all of us. Thanks for all the lovely comments and text messages. It is wonderful to know how much support we have. William is doing really well and is out of intensive care!! He is such a little fighter. He is still in a lot of pain but is nodding and shaking his head and saying the odd word here and there. He is sleeping most of the time but we have had a Thomas story and he has snoozed through a couple of videos. I will tell the whole story but I know people are anxious for the latest news for now. Wills is taking his nystatin medicine orally and loving how it tastes!! It is the first thing he has taken in his mouth for 3 years! All has gone well with William’s transplant and he is out of intensive care! Post can now be sent direct to the hospital (address above) as he will be here for 3 months. William got his ‘call’ at midnight and was transferred up to Birmingham Children’s hospital. He went into theatre at 8am and is getting his transplant!! William has spent the whole of October in hospital. He has been battling with recurrent infections in his Hickman Line. Just as we were hoping to be home soon he started another infection so we will be in hospital for next few weeks at least. It is a very difficult time for us all as Hope and Ellie are away with their Grandparents. We are all missing each other very much. William’s post has really cheered him up. Thanks to everyone who has sent us lovely cards. They are brightening up the wall in William’s room. He loves reading letters and hearing all about the people who write to him. Thanks for all the lovely presents too. It is great to have some new bits and pieces to entertain him with as he gets very fed up. Thanks Dylan and Seren for the lovely Thomas game. We have had loads of fun with that. Thanks Post Pals for the lovely books and parcels. A wind up nose made him laugh for ages. Thanks to everyone else for the colouring books and stickers. A jumping smiley face makes William laugh and laugh. I have been forwarding Hope and Ellie’s letters, cards and gifts and I know they really appreciate them, especially during challenging times like now. I’m sorry for not thanking everyone by name. I am so scared I will miss someone but we do know who you are and will write thank-you letters to those whose addresses we have. Our mail helps keep us going. I hope we will be able to report that William has had his transplant soon. Further update – we are back in hospital with another line infection. We will be in at least 2 weeks. Hope is missing her French exchange and is having an especially hard time. William came home from hospital just in time for his first day school. He has made a really good start and progressed to full time days within the first week. He is learning to read quickly and has read through most of the first stage of the reading scheme already. William’s energy levels are noticeably down on how they were and we can see his health is deteriorating. However, it has been wonderful to be home together. We have made the best of it. Unfortunately, after only 3 weeks at home, William is a bit unwell at the moment and we are waiting to see if he has yet another infection in his Hickman line. We expect to be back in hospital tomorrow and my parents are on standby to collect the girls. This is especially devastating for Hope as she was due to have her partner in her school French exchange staying with us next week. It looks like she will now have to drop out of the programme. All her friends are doing it and she is bitterly disappointed. It is very hard for siblings. Their lives are forever being thrown into turmoil and they miss out on such a lot. We all hope William receives his transplant as soon as possible. Thank you to Julie for the postcard, letter and badge from Cornwall. Thanks to Maddie from Crafting Friends for the beautiful card. Thank you Post Pals and Moonpig for a lovely hello card. Thanks everyone for the lovely letters, we do love reading them. We’d also like to thank Viks and Post Pals for the fantastic bouncy castle. William has had a lot of fun on it. Thanks to those who sent William gifts this month. Thank you Maria and Michael, he loves his Thomas the Tank Engine story CD, it is on most nights as he goes to sleep. The girls loved their goodies too. Thank you everyone for the colouring books, stencil set and stickers. William loves them all. Thanks also for the chocolate buttons for Hope and Ellie. They were very much appreciated. Sorry for not mentioning everyone by name, I am so scared I’ll miss someone who will then feel hurt! Thanks to you all though. William gets so excited when he gets letters, cards and parcels and is cheered up loads by them when he is having a bad day and so do Hope and Ellie. William finally came home from hospital at the end of last week. It is great to be at home together and we hope we will be home for a few weeks at least. We are not so sure though as William is not all that great. He is in a lot of pain and discomfort and his poor little tummy is huge and gassy. He has very little energy these days and can only manage to play in short bursts with lots of frustration and cuddles in between. It is hard to watch as he has gone down hill a lot in the last year with all the infections he has had. We will stay home unless he becomes dangerously ill with another infection. In the meantime, we are waiting to get that call to say a new bowel or ‘new tummy’ as William calls it, has been found for him. Everyday I hope and pray it will be today. The girls are also home and we are all enjoying being together. We still have our Post PalThorpe Park trip to look forward to and the girls and I will be going for some much needed girlie time. William starts school next week. He is going to a special needs school for children with physical disabilities and will have one-to-one support throughout the day. It has been a huge job to get all the arrangements in place and it has all come together just in time. He is really looking forward to it. The only difficult thing is that they don’t want him to finish his TPN dose at school as flushing the line is an infection risk. This means we have had to adjust his TPN time to go up at 8.30pm and come down at 4.30pm. This means poor Wills is attached to his line right up until the end of the afternoon and only has a couple of hours free before bed. He is not very happy about this and it is taking a lot of energy and imagination to keep a tired, sore and frustrated small child tied to a line happy and busy all day. William spent the whole of August in hospital with recurrent infections in his Hickman line. This is because his intestines are now leaking all the bugs into his blood and they are breeding in the line. This is a very dangerous situation and, because of this, William was assessed for his transplant at the start of this month and we received the recommendation that he be accepted for the waiting list for a small bowel transplant. We are now waiting for a suitable organ to be donated. We are starting September still in hospital where William is now recovering from his infections and has had a new Hickman line. We are hoping to be home soon and that we will be able to stay at home long enough for William to start his first year at school. He is really looking forward to going. Thanks to everyone who sent cards and postcards. William really loved opening his post and was very much cheered up by it all. The cards and postcards brightened up William’s room in hospital. William loved all his cards, especially ones with Thomas. He loved the colouring in too. Hope and Ellie also loved their cards. Thank you all so much. We will try and write back to those who sent their address. Thanks also for all the letters. Special mention must go to ‘Percy the dog’. William laughed and laughed at your letter and still asks for it to be read and re-read over and over again. Thanks so much for the little clock work dinosaur. It cheered William up on a very down day. Thanks also for the stickers, bubbles and magic drawing slate. Every little gift William received was immediately put to great use and played with over and over again. This is our first hospital admission since being a pal and all the posty made such a huge difference to William. William currently has gall stones, caused by TPN related liver disease and failure of his intestines to clear the bile. He is a bit jaundiced, sore and uncomfortable from this, but still smiling as ever. He will need another operation to remove his gall bladder but his team wants to assess him for transplant first. We are going to Birmingham Children’s Hospital for 2 weeks from the beginning of August for William to be assessed for a small bowel transplant. This will be an intense fortnight for us all with lots of invasive tests for Wills and difficult counselling sessions for Mum and Dad.